After leading the Green Bay Blizzard through the final two-thirds of the 2018 season on an interim basis, the team has named Corey Roberson as its official head coach. Roberson becomes the second Indoor Football League coach to be elevated from interim status to head coach for the 2019 season. On July 2, the Nebraska Danger promoted co-interim head coach and defensive coordinator Cornelius (Pig) Brown to head coach. Roberson took over for the dismissed Chris Williams after the Blizzard had opened the season 0-5. He led the Blizzard to a 2-7 overall record, with both wins coming over the Danger (47-25 in week 11 and 31-20 in week 13). The Blizzard took the six-time IFL champion Sioux Falls Storm to three overtimes before falling, 69-61, in the season finale. "I am honored and humbled that the Blizzard's ownership team of Larry and Kathy Treankler are giving me the opportunity to guide this franchise and move it forward in a positive direction," Roberson said on the team's original press release. "I will work tirelessly to create a culture of accountability and dependability. Once those are established, everything should play itself out. "We will put a team on the field that plays hard, fundamentally sound team football. We will build a team that 'Titletown' fans will relate to and be proud of." 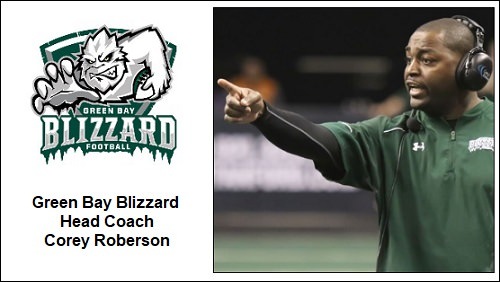 Roberson has an extensive background in indoor football and with the Blizzard in particular. Prior to being named interim head coach last season, he was an assistant coach for the team. He spent 2011 to 2013 coaching special teams and skills position players. He moved on to become the defensive coordinator from 2014 through last season. Roberson completed a nine-year playing career with the Blizzard in 2010 as a defensive back. The Blizzard will enter their 10 IFL season in 2019. Per the team's press release of Roberson's promotion, the assistant coaching staff will be announced later this off season.